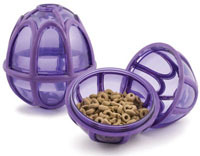 The Kibble Nibble is Premier Pet Products new MEGA treat delivery toy. This big boy holds over 2 cups of kibble. Increase the ease with which the Kibble Nibble releases its treats by trimming the “treat meters” inside the opening at either end of the toy. This toy has been indestructible, even though Ashley kicks it around for an hour when we put her entire meal in it. If your dog gobbles his food, you need the Kibble Nibble. This refillable toy will slow even the fastest eater wayyy down! If you need a toy that will keep your busy dog occupied when he’s home alone, buy a couple of the Kibble Nibbles! Check out the rest of the refillable treat toys we have for you and your Fido. The Bristle Bone, Funny Bone, Tug-a-Jug and Bouncy Bone can all be seen in action just by clicking the links.